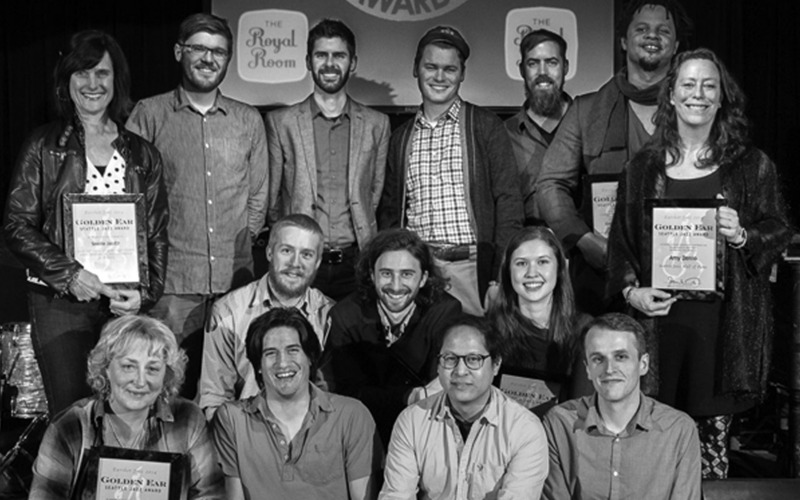 Award recipients (bottom row) Greta Matassa, Ivan Arteaga, Chris Icasiano, Neil Welch, (middle row) Nick Rogstad, Levi Gillis, Carmen Rothwell, (top row) Laurie de Koch, Brennan Carter, Evan Smith, Jacob Zimmerman, Josh Rawlings, Evan Flory-Barnes, and Amy Denio. Photo by Daniel Sheehan. 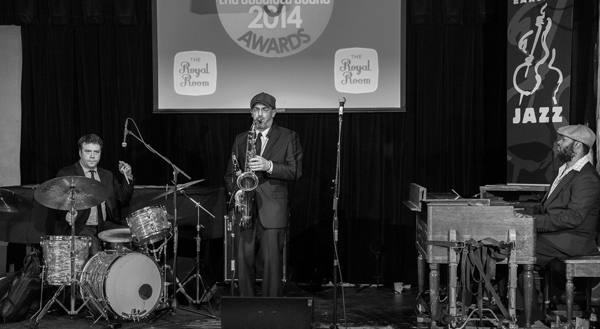 The 2014 Golden Ear Awards, celebrating the contributions and achievements in Seattle jazz, were presented at The Royal Room on March 16. The Kareem Kandi Trio –Kareem Kandi on tenor sax, Delvon Lamarr on B3 organ, and Julian MacDonough on drums – opened the evening, and jazz radio broadcaster Jim Wilke emceed the award ceremony. Each year, the Golden Ear awards give jazz fans an opportunity to vote for the outstanding musicians, community members and events of the previous year. A call for nominations goes out in January, with a public ballot then distributed by the Earshot Jazz website and publication. More than 5,000 votes were cast this year. 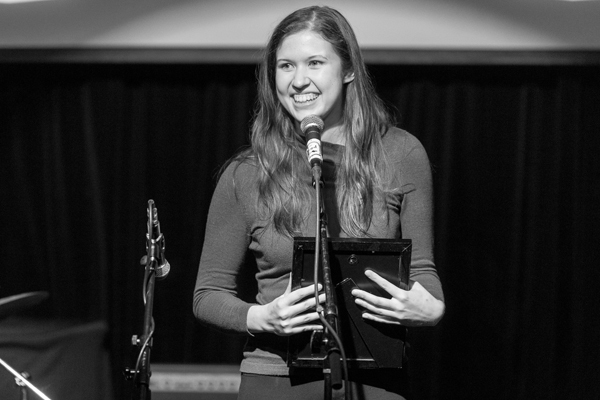 Bassist Carmen Rothwell accepts the award for Emerging Artist of the Year. Photo by Daniel Sheehan. The Kareem Kandi Trio kicks off the night at The Royal Room. Photo by Daniel Sheehan. 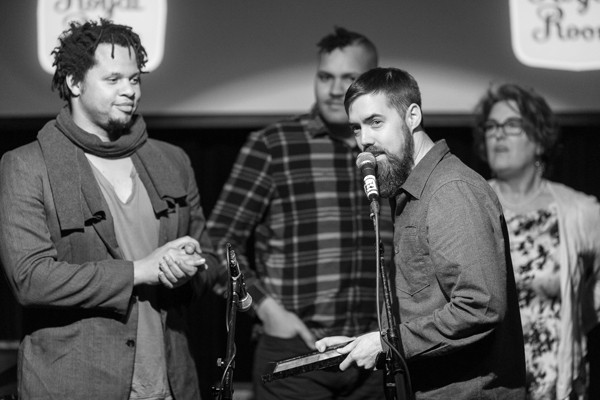 Industrial Revelation’s Evan Flory-Barnes, Aham Oluo, and Josh Rawlings accept the award for Alternative Jazz Group of the Year. Photo by Daniel Sheehan. 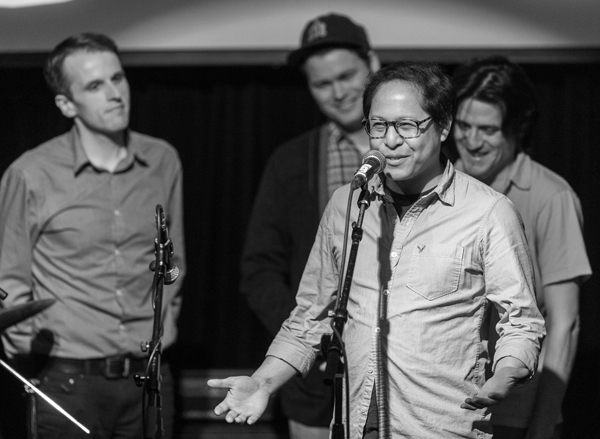 Table & Chairs’ Neil Welch, Jacob Zimmerman, Chris Icasiano, and Ivan Arteaga accept the award for NW Concert of the Year for the Table & Chairs Showcase at the Ballard Jazz Walk. Photo by Daniel Sheehan. 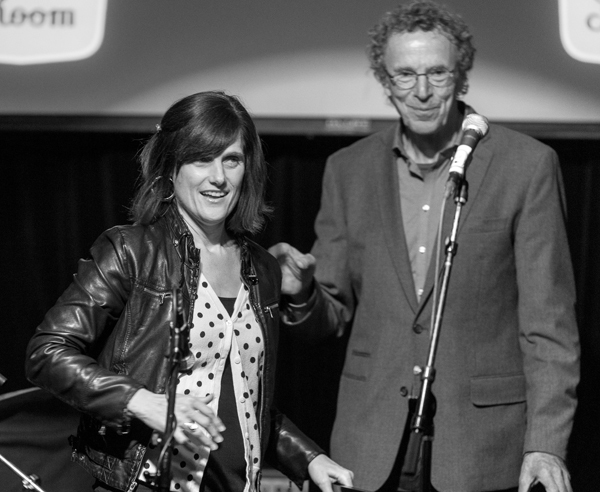 Seattle JazzED’s executive director Laurie de Koch accepts a Special Award from Earshot’s John Gilbreath. Photo by Daniel Sheehan. 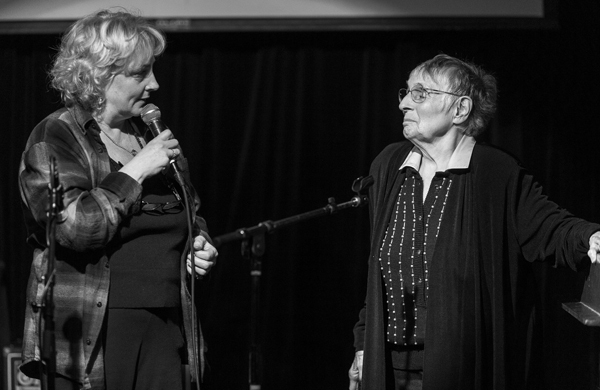 NW Vocalist of the Year Greta Matassa was also inducted into the Seattle Jazz Hall of Fame by longtime jazz advocate Lola Pedrini. Photo by Daniel Sheehan. 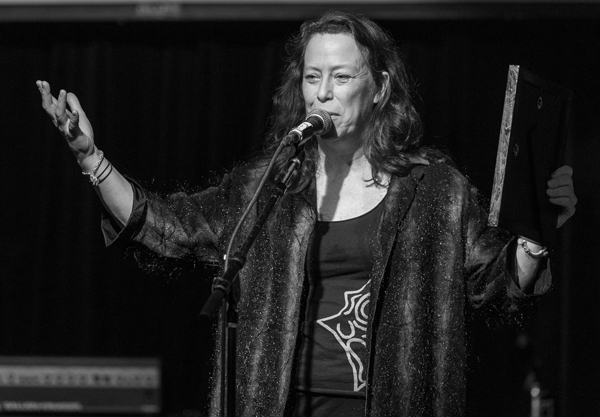 Multi-instrumentalist and “Seattle’s Jazz Ambassador” Amy Denio is inducted into the Seattle Jazz Hall of Fame. Photo by Daniel Sheehan. 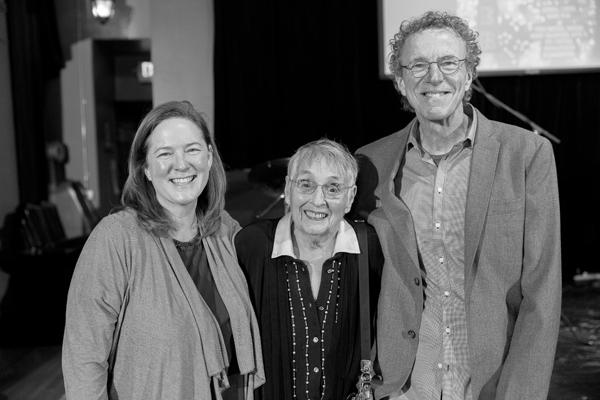 Seattle jazz advocate Lola Pedrini stands with Earshot Jazz Managing Director Karen Caropepe and Executive Director John Gilbreath. Photo by Daniel Sheehan.